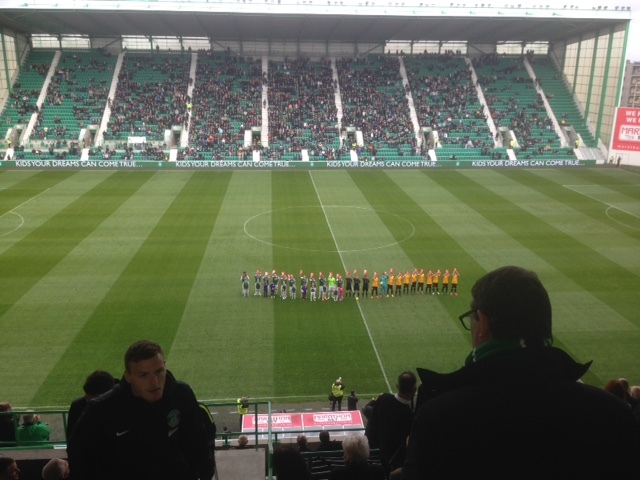 Hibs gained revenge for their defeat to Dumbarton in the opening game of the campaign with a comfortable 4-2 victory at Easter Road this afternoon. The score-line actually flattered the ‘Sons as Hibs dominated throughout and could have scored several more. Head Coach Alan Stubbs made three changes to the starting XI that beat Queen of the South 3-0 at Palmerston two weeks ago. Liam Fontaine returned to the centre of defence replacing Paul Hanlon who was rested, whilst Fraser Fyvie and James Keatings took over from Marvin Bartley and Dylan McGeouch who both started on the bench. Also on the bench was Jordon Forster, making his first appearance in the squad since picking up an injury in the first game of the season and on-loan Chelsea midfielder Islam Feruz. Former Hibs’ goalkeeper Mark Brown started for Dumbarton alongside ex Hearts defender Darren Barr. Before the start, players from both sides held up red cards as part of the national ‘Show Racism the Red card’ campaign. Hibs started brightly and had two penalty claims denied in the opening 13 minutes, firstly when Jason Cummings was bundled over inside the box then when a John McGinn volley struck the hand of Frazer Wright, but both appeals were waved away by the referee. The game then burst into life with three goals in five minutes. Dominique Malonga opened the scoring in the 20th minute when he fired the ball into the top corner of the net from the edge of the box after playing a one-two with Liam Henderson. As the fans were celebrating, a lapse in concentration in the Hibs’ defence allowed Grant Gallagher room inside the area and the striker blasted the ball past Mark Oxley to level the score. Moments later, Hibs regained the lead when Fontaine headed home from a McGinn free kick. The hosts then dominated possession and had a third penalty claim denied when Malonga was hauled to the ground but once again the referee waved play on. Both Henderson then Cummings went close before Hibs added a third just before the break. A long ball from McGinn appeared to strike Barr’s hand before falling into the path of Cummings who was immediately brought down by two Dumbarton defenders. Finally the referee pointed to the spot however it was unclear whether the infringement was for the handball or the foul but the fans didn’t mind and Cummings dispatched the spot kick into the bottom left hand corner of the net. Hibs added a fourth in the 59th minute when Lewis Stevenson played a one-two with Cummings before sliding the ball into the path of Keatings who sent a left foot shot past Brown and into the net. Stubbs made three substitutions in the space of eight minutes with Keatings, Fyvie and Cummings all leaving the field to standing ovations and being replaced by Marvin Bartley, McGeouch and Feruz. With 17 minutes remaining, Dumbarton pulled a goal back when Steven Craig headed a Mark Docherty free kick into the net but Hibs easily held on for the victory and could have added a fifth near the end but Brown managed to save a goal-bound effort from Malonga. Elsewhere Rangers came from behind to grab a late winner against Queen of the South at Ibrox. Hibs; Oxley, Gray, Stevenson, Fontaine, McGregor, Henderson, Fyvie, McGinn, Keatings, Cummings, Malonga. Subs: Reguero, Bartley, McGeouch, Boyle, Feruz, Carmichael, Forster.